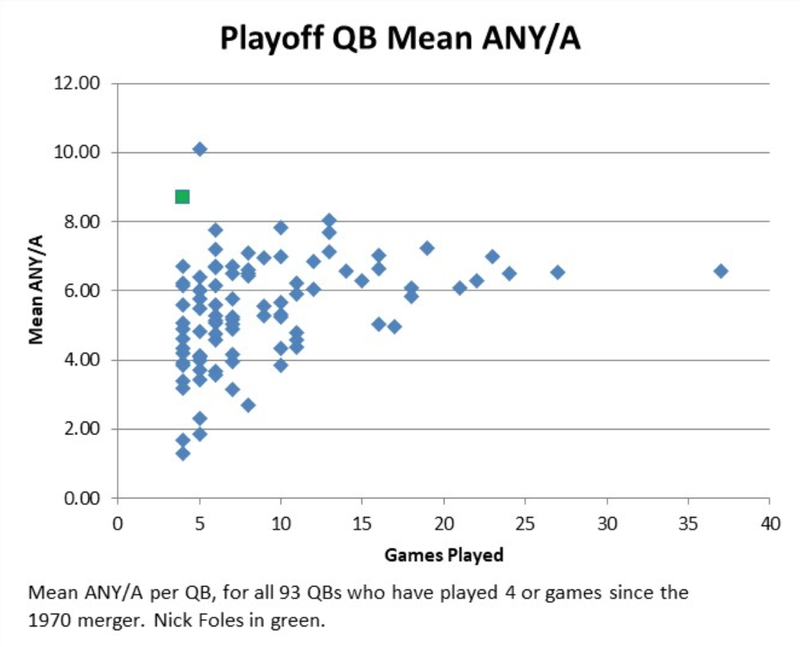 Nick Foles is a high-variance quarterback. His performance ricochets from abysmal to sublime with such frequency that he made me re-adjust my chart axis, twice. And yet: including the 2013 loss to the Saints (in which he engineered a comeback from a 13-point deficit and left the field with the lead) his postseason play has been consistently excellent. There have been 93 quarterbacks since the 1970 merger who have played at least 4 playoff games. Of these, Foles ranks 1st in completion percentage and 2nd in Adjusted Net Yards / Attempt (ANY/A). Obviously, this is not statistically dispositive. Nothing about playoff analysis is. Mark Messier and Reggie Jackson’s playoff performances comprised a mere fraction of their total careers, yet their knack for elevating their game on the biggest stage is what made them memorable. One way to think about the playoffs: there is a tide in the affairs of men, which, taken at the flood, leads on to fortune. As I will show, Foles has taken the tide at the flood in historic fashion. Note, from the chart above, that the fewer games played, the greater variance in ANY/A between individual players. But what about each player’s game-by-game variance? I measured the standard deviation of each player’s game ANY/A, and scaled this by his mean ANY/A, thus constructing a coefficient of variation. Of all 93 QBs in the sample, Foles has been the 4th most consistent (i.e. has the 4th lowest variation). Moreover, he has the lowest variation of the 16 QBs who have only played 4 games. Foles has the 5th highest Relative ANY/A in addition to having the 4th lowest variation. One way to think about the above graph is to imagine an “efficient frontier” on the upper left quadrant. When considering similar efficient frontiers in the context of financial economics, Nobel Laureate William F. Sharpe constructed a “Sharpe ratio” which compares a fund manager’s relative return (e.g. versus an index) to the standard deviation of the fund’s return. Obviously, I’m not suggesting Foles is better than any of those quarterbacks (except Eli; he’s indisputably better than Eli, it’s not even close). However, in the inherently limited sample that consists of the playoffs, Foles has performed at a historically great level, in terms of both efficiency and consistency. Also, he can catch. 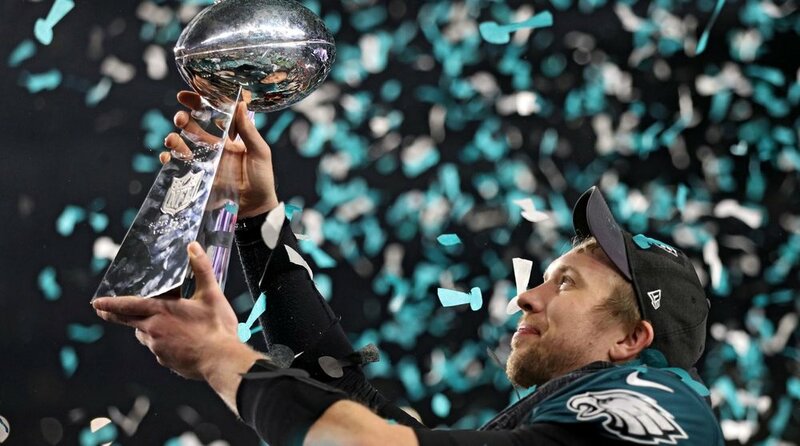 Tagged with Super Bowl, Nick Foles, 2017, 2018, Playoffs, Quarterback, Statistics. February 13, 2018 by Brian Solomon.